I read this like two months ago and suddenly remembered it again. It's so interesting. Thanks for scanlating it! You're welcome. :) I'm hoping to have a new chapter out in a few weeks. keep up the good work, i really enjoy this sranslation. um, when are you gonna release the next chapter? i found this manga really good, so i just wanted to know around when you would have it out. Sorry it's been so long. I've been really busy, but I definitely plan to have another chapter out next month. I couldn't wait and took a lightning quick look at the entire remaining manga (raw). Now I'm more impatient for the scanlations. I hope to have a chapter out this month sometime! There are only the first three chapters because that's all I've translated so far. I will add future chapters here when I have a chance to translate them. All the chapters I've scanlated are here. I had your RAW files in ZIP format, ciuld you please tell me where you've put them online or send them back as I really do need them. Yes, I plan on finishing the entire 3-volume series. However, I don't know when I will get the next chapter done. Hopefully within the next couple months. Look guys are u still working on this manga? I really like it i want to see the chapter 5 please hurry up with an anser. When do u think chapter 5 will be done? Hopefully sometime in the next couple months. Sorry it's been so long. Look guys there is a manga with no releases just one and i would like you for u to try to continue that manga. The manga is "happy trouble weeding"
I'm sorry, but I already have my hands full. I understand being frustrated about a dropped series, but according to Baka Updates, Happy Trouble Wedding is an ongoing series, already seven volumes long, and I just don't have the time to commit to another project that long. Hopefully some other group will pick it up eventually. It sounds interesting. P.S. : Sorry for my english i'm portuguese and sometimes is hard to explain myself. Sorry to bother but the 6 chapter of "Child's child" it would be release this month? And how long it will take? Hopefully I'll have the next chapter posted sometime this month. Could you please try to make more scantilations faster since your last one was April 16, 2010. I really want to read the rest of this and there are only 4 chapters out. it would be really nice if you could get the rest of the 3 volumes in as soon as possible thank you. I'm glad you enjoy it, but this is something I do by myself in my free time. I am working as fast as I can on it. Hi you said that you were going to release the new chapter this month but that probly wont happen are u? I stumbled across this manga and am so glad I did. Thank you so much for scanlating it, it's super appreciated. I've donated a bit to help with server costs, so you can continue this awesome project! Mehchan, thankyou for scanlating this series, if you didn't scanlate it, i wouldn't ever find this amazing manga. Glad you're enjoying it. I should have the next chapter posted within a week or two. Glad you're enjoying it. I should have the next chapter up sometime this month. Hey I just discovered this series and I want to say thanks for your effort to translate it. Its a very interesting series and I look forward to reading the whole thing!! I am afraid of what I will read. I do understand you're doing this in your spare time and you have a lot of work with your other projects too, but please don't forget about this one. I haven't forgotten about it. It's the manga I'm updating *most often*. Which, yeah, I realise is still not super often compared to groups that update every week or every month, but I have added four new chapers this year and if you read the other comments, have repeatedly stated that I'm in the middle of chapter 9 and plan to have it out before the end of the year, so it's pretty clear I haven't forgotten about it. OK Megchan, don't take things badly it was just a little remark. I didn't want to hurt or to push you. 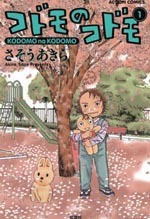 It is just great to read this manga in English. Kodomo no Kodomo is sooooo awesome thank you so much for your hard work and dedication to the project!!! Really good keep it up. Cant wait for the next chapter!!! Hey megchan do you know when you are going to release the next chapter. No, I don't. Hopefully within a couple months. First I'm going to work on Yasha, though. Hopefully the next won't be too delayed. Thanks. My this manga really good, I'm glad I give it a try. ah! and thanks for the raw link. cant wait for the next chapter!! Sorry it's been a while. Hopefully I'll have new chapters in the near future. Aw, I'm sorry it's been so long! The next chapter will be up in April for sure. yaaay thank youuu for the new chapterrrrr!!!! Looks like an unique read, please keep it up. So Happy with the new chapters! Thanks for the chapter :D I miss reading the series and had forgotten about it for a while. Super thanks! You are awsome, thanks for your hard work, we are looking forward for the rest ^>^! I just picked this up recently thanks for all the hard work megchan, (Yes I know my manners since im a turnipfarmers scanlators fanboy and everyone always says thanks to them) omg its on such a cliffhanger does anyone know where I can read the Raw? By the way I just literally found this manga today and catched up today aswell! Also I hope the teacher doesn't get criticised much I hope they dont blame her :( and I hope its a Happy ending lol and the real father gets some proper love! It looks like all the previous upload links I've left are dead, but I've also uploaded them to my server. Just caught up with everything you have translated so far. Thank you so much for picking this up! This is such a change of pace from most of the series we all read, and so far it has been great! I could easily see people giving up on this because there's not your 'typical' manga characters, but this story is amazing and I can not thank you enough for sticking with it! I am going to go ahead and look at the raws, but I know I can not wait to see the rest of it translated. I'm glad you're enjoying it! :) It's definitely a unique manga. This is an amazing scanlation. Thank you so much. Can't wait to read the ending. My gosh! I've been reading this non-stop so far tonight and I just got to chapter 23… it's so beautiful how these kids are so much like a real community! As soon as I got to the part where her classmates are bringing in gifts, I couldn't help crying… So beautiful.. Thank you very much for scanlating this series, It's a good manga and really well done scanlation. Thank you for all your hard work mate! Nice work! Just read the last chapter ^.^ . It was a well made story, thanks again for translating and sharing it with us, THE ReaderS! You missed same Page on the end of Chapter 8. I fixed it! Thanks for the heads up.